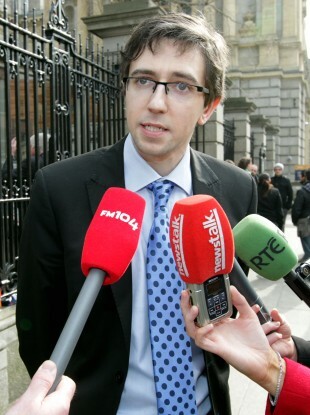 Simon Harris has defended the role of the Public Accounts Committee following criticism yesterday. JUNIOR FINANCE MINISTER Simon Harris has defended the Public Accounts Committee (PAC) in the wake of criticism from one of his government colleagues yesterday. Harris said that many politicians have a “healthy appetite” for being in the media and defended the right of the PAC, a committee on which he used to serve, to investigate controversial spending of HSE funding by the Hepatitis C support group Positive Action. His comments follow Fine Gael colleague and Oireachtas Health Committee chairman Jerry Buttimer’s criticism of PAC for having “an insatiable appetite to perform in the media”. Buttimer insisted that his committee – and not PAC – is the appropriate body to investigate the Positive Action controversy. But PAC chair John McGuinness has insisted he and his colleagues will be doing their own investigation of the spending. Harris said he does not have “a strong view” on the issue but said that both committees were entitled to look at it. “During my time as a member of the Public Accounts Committee we certainly probed a wide variety of areas. The logic with PAC probing those areas was always that taxpayers’ money was involved,” he told reporters in Dublin yesterday. Harris said the issue of which Oireachtas committee should investigate an issue of public interest crops up “quite a bit” and suggested it was time for Oireachtas authorities to clarify the matter. “I think the main thing from the taxpayers’ point of view and from the patients’ point of view and the public interest point of view is that these issues are all looked at and I expect they will be,” he said. Email “Simon Harris: Politicians love being in the news - but that's a good thing ”. Feedback on “Simon Harris: Politicians love being in the news - but that's a good thing ”.